Thank you, East Tennessee, for donating $140,207 in just one day for East Tennessee Children’s Hospital! Join us as we dedicate an entire day of radio to raising money for East Tennessee Children’s Hospital! Tune in to NewsTalk 98.7 from 6:00 a.m. to 7:00 p.m. to hear stories about the many ways Children’s Hospital has impacted our community, including real-life patient stories. Money raised during the radiothon will help purchase the “Lifeline for Children’s Hospital,” a new intensive care transport ambulance. Become a Champion for Children by donating $20 or more on a credit card each month, and you’ll get a pair of tickets to Dollywood’s Splash Country! 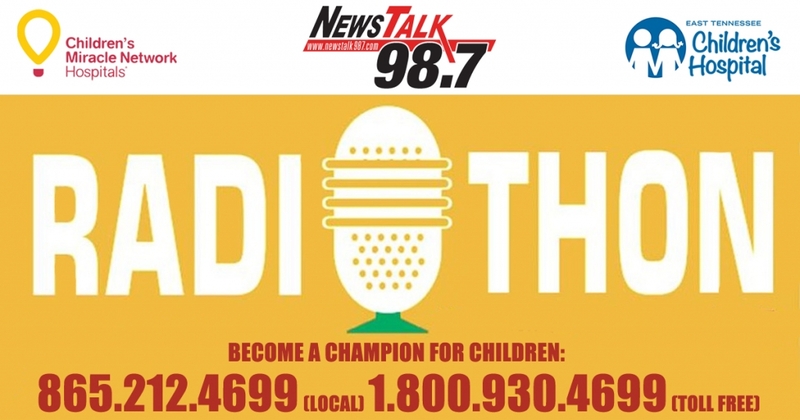 The NewsTalk 98.7 East Tennessee Children’s Hospital Radiothon is brought to you by Diversified Enclosures & Screen. Tickle time breaks throughout the radiothon help lighten the mood after a moving patient story and are brought to you by Dr. Kotsianas, General Cosmetic & Dentistry. The radiothon phone bank (local: 865.212.4699 / toll free: 1.800.930.4699) is brought to you by Image Matters. Family moments provide insight into the many ways Children’s Hospital has positively impacted our community and are brought to you by Elliott’s Boots & Shoes. Become a Champion for Children by donating $20 or more on a credit card each month and receive two tickets to Dollywood’s Splash Country! Special thanks to Einstein’s Bagels, Moe’s Southwest Grill, Big Kahuna Wings, and Le Noir for providing food throughout the radiothon for our patient families, volunteers, and staff.